Using more than 5.3 million Lego bricks, a team has constructed a life sized X-Wing to celebrate the launch of The Yoda Chronicles on Cartoon Network. There is a place where dreams come true. It's not in the clouds, or some land of milk and honey. It's at the LEGO Model Shop in Kladno, Czech Republic. There, following months of planning, thirty-two person team of professional Lego builders toiled to construct arguably the coolest thing ever crafted by human hands: a life-size X-Wing starfighter built almost entirely out of Legos. The model which weighs a staggering 45,980 pounds was made with 5,335,200 individual Lego bricks. The planning stages alone took months to complete while the actual construction took place over four months and totaled a whopping 17,336 man hours to complete. "This has been a wild and exciting project for us, and it's taken an international team of designers, engineers, structural consultants, model builders, and logistics personal over a year to bring this model from a conception to reality," said Erik Varszegi. As complex as the project was, not every part of it was difficult. "Designing it was the 'easy' part, as we were creating a scaled version of an actual toy construction set." Held together by a specially designed steel frame, the X-Wing was broken down into thirty-four pieces following its completion before being shipped by boat to the New York It was then reassembled and unveiled at an event in Times Square celebrating the impending launch of The Yoda Chronicles, a three-part mini-series that will air on Cartoon Network starting on May 29th. 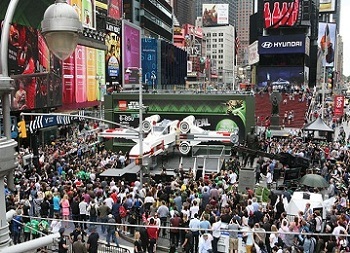 The X-Wing will remain in Times Square until the end of this coming weekend, after which it will be transported to Legoland California where it will remain on exhibit for the rest of the year.